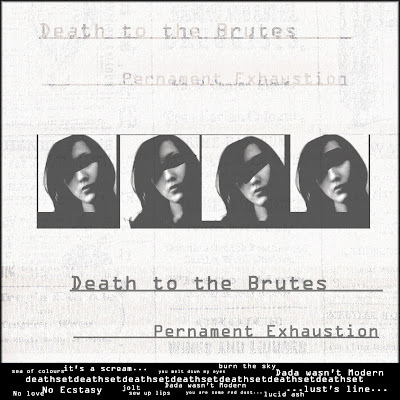 Burning World: Death To The Brutes - Permanent Exhaustion E.P. This is more like it. Probably the most angry record I've heard all week. Why is every one so bloody happy at the moment. Nix is away this week so I'm probably just a bit grumpy about having to tackle cooking (not a good track record, I can set eggs on fire). Nevertheless this is a great E.P. from Death To The Brutes which consists solely of Brigitte Roussele from Nac/Hut Report who have been featured in these pages many times in the passed. This is probably Brigitte's best work to date, certainly very different to the far more tuneful "9th Overflowing...Milky Slaughterhouse...Dream of Incubator" album which I posted on this site last year. You can probably still find it if you search hard enough.